Last week, we joked that we don’t challenge beliefs. Here’s one that we want to challenge today: the dollar doesn’t work as a currency, because it’s losing value. Even the dollar’s proponents, admit it loses value. The Fed itself states that its mandate is price stability—which it admits means relentless two percent annual debasement (Orwell would be proud). So there is no question that the dollar loses value. The only mainstream debate is whether this is good or bad. Our focus today is whether this is why the dollar doesn’t work, why it’s failing. Prices have been rising for 100 years. There is no reason why they couldn’t go on rising for another 100. Or 1000. The inflation argument, as we call it, does not reach anyone other than those who already think the dollar is failing. The rest shrug it off. Most people really care only if their income goes up slower than prices go up. As an aside, this is an inaccurate view. Measured in gold, prices are falling. This is the simple consequence of relentless productivity improvements in every industry from mining and farming to distribution to manufacturing. In an article for Forbes, Keith found that the resources that go into producing a gallon of milk fell by about 90% between 1965 and 2012. And wages are falling also. Read the article to see just how much. Anyway, people care if their wage is falling faster or slower than prices. Mainstream economics encourages this with its paradigm of purchasing power. They don’t encourage thought about how much cheaper things really have become. The argument that “we need to move to the gold standard, because inflation” is not compelling to most people. We believe it’s more compelling to show that the dollar makes it profitable to destroy capital. Unlike rising prices, capital destruction is not sustainable. And also unlike rising prices, capital destruction is a real worry to the 1%. Now let’s get back to the argument: the dollar doesn’t work as a currency. Is that even true? Everyone knows he can take out a twenty dollar bill and buy dinner or gasoline. Anyone can write a check to pay the landlord dollars. Or deposit his paycheck. Everywhere you look, you see people using the dollar as medium of exchange (which is not our definition of money). What, exactly, isn’t working here? How do you explain to all those wage earners, employers, landlords, restaurants, and gas stations that they aren’t successfully doing, what they are doing? Keith spoke at an Austrian economics conference at King Juan Carlos University in Madrid in November. The speaker before him said that only gold is money. The audience—these are professors and PhD’s and graduate students interested in Austrian economics—were incredulous. They demanded if the guy really said there is no money today, and if so how does he explain the vast flows of commerce around the globe? The explanation is that we have a currency that’s working just fine as a medium of exchange (and Keith stood up and explained that the definition of money is either (A) the most marketable commodity or (B) the extinguisher of debt). Marketability refers to the loss you incur if you trade in and out of something. In more technical terms, this is the bid-ask spread. The bid-ask spread of the dollar is zero. There is no spread. This means that trade using dollars is frictionless (well, at least frictionless on account of the medium of exchange). Not only is the dollar working as a medium of exchange. It could not possibly work better (though it’s not working for other functions). Now let’s look at gold. An American Eagle gold coin, in the typical retail shop on the corner of First Street and Main, has a bid-ask spread of 5% or more. On the Internet, you might get this down to 2% (though the transaction is not instantaneous) plus shipping cost. How is this better than the US dollar? It cannot compete as a currency. Online gold accounts, which hold generic bulk bullion, are better still. One industry leader sells gold to you at spot + 0.5%, and buys it back from you at spot – 0.5%. This is a bid-ask spread of 1%. 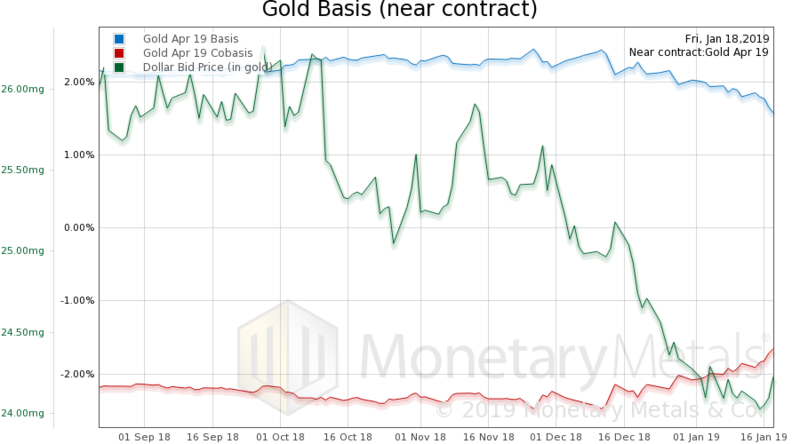 It is closer to the dollar, but it still cannot compete (unless the price of gold is rising rapidly and consistently enough that a gold account is a free-dollar-machine, like bitcoin was in 2017). We can hear the objection all the way through the Internet. “Yes, but no one is using gold now. If people were to start to use it, these spreads would tighten.” That is true, they will tighten, perhaps significantly. But our point is that they cannot go to zero. The spread on the dollar is zero, so that’s the number to beat. Money (gold) is the most marketable commodity. If you don’t believe us, we suggest you ask how much the local landscape center will pay you for a load of gravel. Compare that to how much they will charge to sell it to you. Or go to a scrap metals dealer and ask for their bid on some lengths of copper pipe. Or a jewelry shop to sell your diamond. Not even in the gold standard, does the bid-ask spread on the gold coin go to zero (unless, as in 19th century America, the government subsidized the coinage). Even bulk generic bullion in a storage account would not be frictionless. Enter, currency. Currency is the most marketable credit instrument. People today often wonder what would have made anyone in the 19th century accept paper bank notes, if they weren’t warehouse receipts. And what makes people today accept the US dollar (no, it’s not the military threat to blow up Libya that makes Americans happy to accept dollars). Currency, unlike gold metal, can have a zero-spread. That means it’s perfectly frictionless. The engine of commerce seeks the lowest-friction lubricant for its gears and cogs. An individual may hoard gold coins under his mattress (which is his right that should never be questioned). But production and trade demand greater efficiency. They demand currency. Absent a zero-friction gold currency, they will use the zero-friction irredeemable currency. The US dollar. The dollar is failing as a stable store of value. Even dollar apologists know this. That’s why they prefer to own assets that are going up. The dollar is failing as a unit of account, notwithstanding the fact of a low inflation rate. The dollar is failing as a unit of measure of economic value. It’s failing as a vehicle for savings, thus rendering saving impossible, thus dooming young wage-earners to never achieve their retirement goals. However, it is not failing as a medium of exchange. In order for gold to get into the same arena to compete with the dollar as medium, much less displace it, there will have to be a gold currency with zero spread. Such a currency would offer people the best of both worlds: frictionless medium of exchange plus act as a stable numeraire, stable measure of value, and a stable vehicle for savings. We think the outcome of such a contest is easily predictable. Monday was Martin Luther King Day in the US. The price of gold dropped six bucks. The price of silver fell 26 cents, a greater percentage. The price of gold can sometimes correlate well with the price of stocks. For example, April 2009 – July 2011. The price of gold went from $892 to $1,626, while in the same time period the S&P went from 841 to 1,289. The percentages are different—gold’s was 82% and the S&P’s 53%— but they moved together. And now, they seem to be anti-correlated. We often argue that the obvious explanation for price moves is wrong. But in this case, we think that gold is trading as the un-confidence asset. But let’s add some color to this. No one vacillates back and forth on a daily basis, believing that the system will collapse alternatively with everything is fine. That’s not what these safe haven / risk on trades are about. For now, the gold buyers are not buying Armageddon or even insurance against systemic collapse. The vacillation comes from them trying to figure out of the Fed has effectively added a third mandate: a rising stock market. They’re wrong, the Fed hasn’t done any such thing. But so long as people believe in the mythical Greenspan put (or now, the Powell put), they will trade this way. Anyways, people are still very much in a bubble frame of mind. When facing the prospect that the Fed cannot or will not keep pumping air into the stock market (as they picture it), they just turn to the next asset to bet on. In this case, gold. If the price of gold rises enough, then many may conclude that “it’s on”, and gold could get a risk-on greed bet too. When they finally lose the bubble mentality, then they may buy gold much more than today. But, then, it won’t be for price gains. We will see that trend change long before the price action shows it. 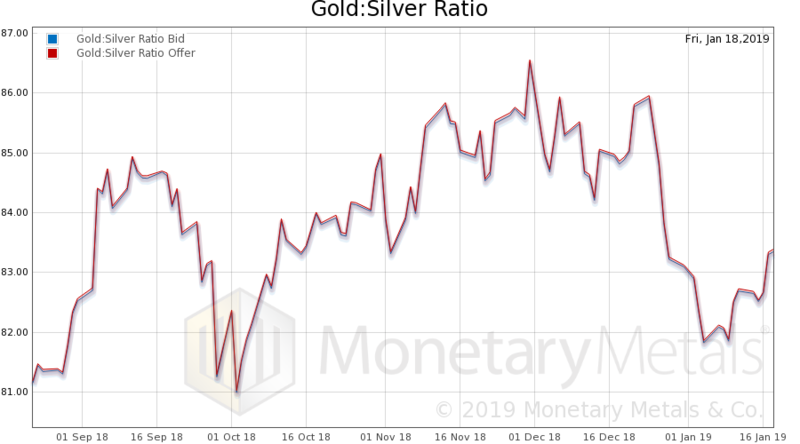 So let’s take a look at the only true picture of the supply and demand fundamentals of gold and silver. 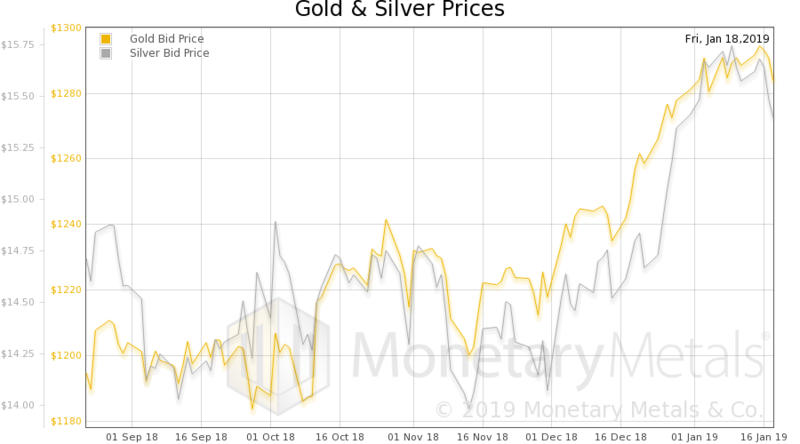 But, first, here is the chart of the prices of gold and silver. We just rolled to the April contract. The rise in the cobasis, ongoing since mid-December, is evident. This is despite (or not) the drop in the value of the dollar (inverse to the rise in the price of gold). And also with Friday’s $10 sell off in gold. 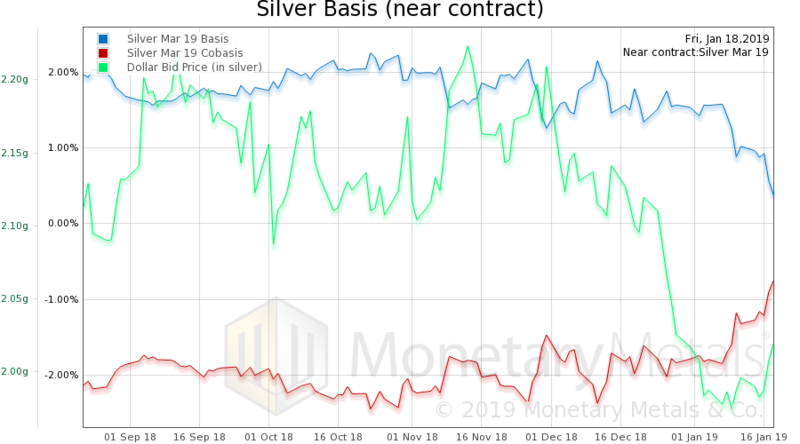 As the price of silver fell more, the cobasis (scarcity) rose more. The Monetary Metals Silver Fundamental Price is unchanged $16.00. Isn’t that incredible? The market price dropped almost two percent and our model of the fundamentals is stable.